Product prices and availability are accurate as of 2019-04-17 11:20:11 BST and are subject to change. Any price and availability information displayed on http://www.amazon.co.uk/ at the time of purchase will apply to the purchase of this product. Glenmorangie have the tallest stills in Scotland. Their long copper neck reach a height of 5.14 meters (16ft 10 1/4 inches) which is the equivalent of a fully grown giraffe. This height of stills allows the lightest and purest vapour to reach the maximum altitude which in turn give a smoother more elegant whisky. At Glenmorangie they select the finest oak casks in which to mature their whisky. But each cask is only used twice for production of the Original (whilst many others use theirs up to five or six times), ensuring that the maximum amount of flavour is always extracted during maturation which gives a rounder, smoother taste. 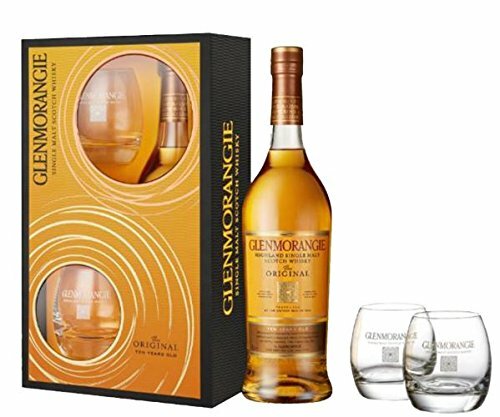 Glenmorangie regularly triumphs at the influential International Wine & Spirit Competition (IWSC). It has won more Gold Best in Classmedals in the past five years than any other single malt Scotch whisky. Our innovation has also been recognised further afield: the US edition of Wine Enthusiast magazine awarded us the accolade Distiller of the Year 2011’. 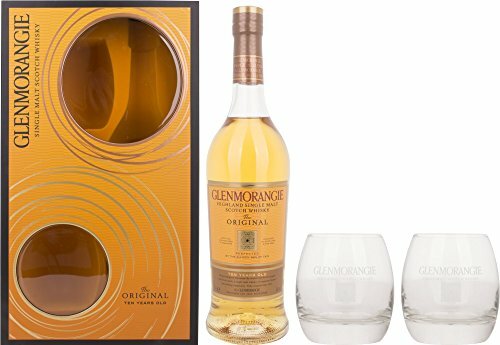 A well presented whisky gift set containing a 70cl bottle of the world renowned Glenmorangie single malt scotch whisky and a pair of Glenmorangie branded whisky tumblers. Glenmorangie single malt whisky is world renowned for its finesse and complexity. 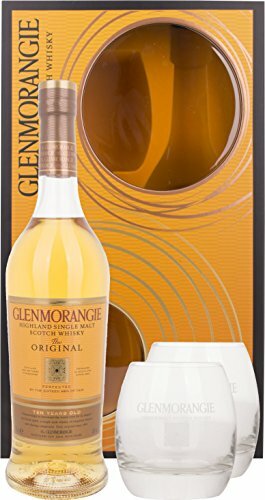 This whisky is both smooth and silky on your tongue giving you a full palate of zingy zesty citrus fruits. 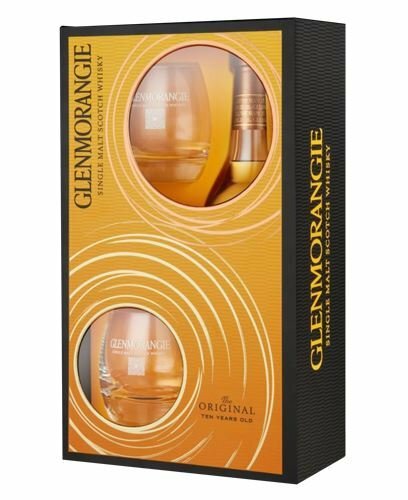 A ten year old single malt, Glenmorangie Original is produced by marrying the delicate spirit that emerges from Scotland's Tallest stills, with the first and second fill American white oak casks. It is here, maturing for ten long years in a range of ex-bourbon casks such as the famous slow-grown and air-dried 'designer casks' from Missouri, that allows for the development of a perfect balance between sweetness and complexity. A mature whisky that is soft, mellow and creamy.